I hope you have had a wonderful weekend; I just realized I am covered in drywall dust. Yes, literally just now. Here’s why- remember this lantern I pulled the trigger on last weekend for my foyer? Well, it wasn’t supposed to arrive until mid-late March… so, when I got the shipment notification on Thursday with a scheduled Friday delivery- done! Weekend plans scheduled! Well, there was a flush mount ceiling light obstructing the view to the foyer and I wanted it to be “clean line” so on Friday afternoon, my husband came home with tools to replace the fixture with a can light. I’ll skip all the details for now and share when I reveal the new foyer light, but long story short, we did not get by with a straightforward task of taking down one light and hanging another. And, that’s why I am covered in white dust. 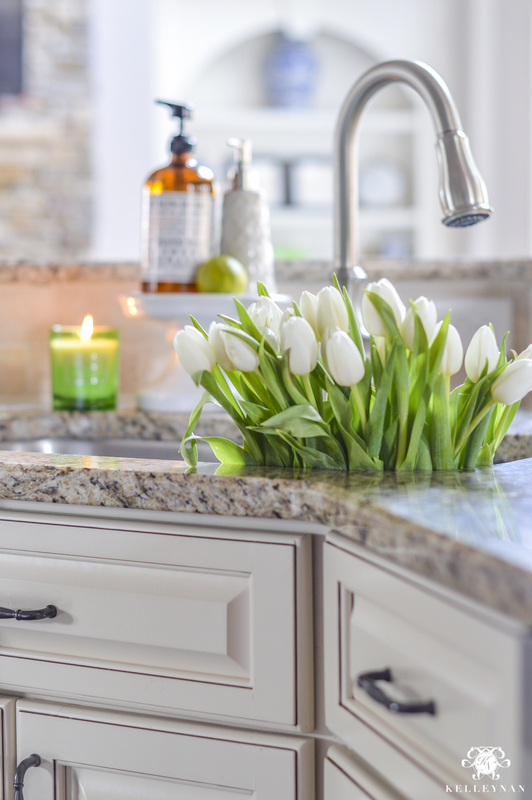 Meanwhile, I was am also preparing for some spring tours which means a 2 hour round trip trek to Trader Joe’s, marathon flower arranging sessions, cleaning and picking up from all those other projects (like the foyer closet makeover that still has the dining table cluttered with tools). I felt broken last night with sore bones and ladder foot and as soon as this post is wrapped, I will have to get back to it as I’m shooting spring photos today and it still looks like a tornado hit our house. A smaller tornado than yesterday but still a tornado, nonetheless. 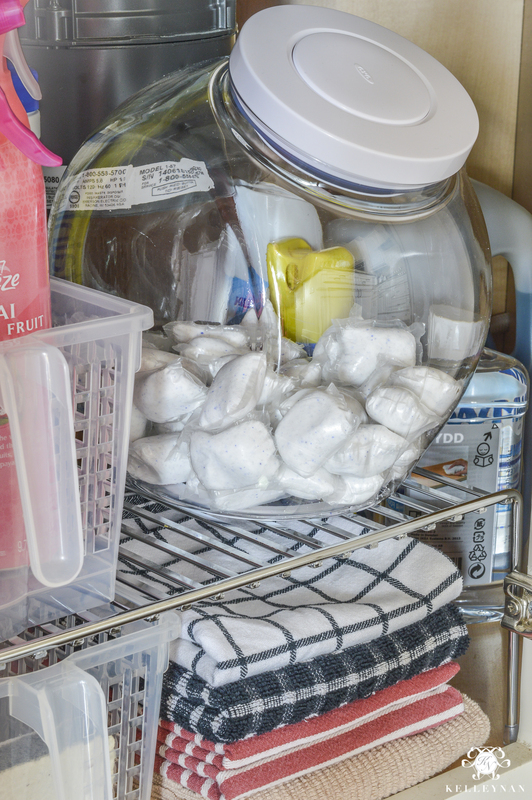 I have to tell you/ask you about one more thing and then I’ll finally get to the point of this post – a project I completed two weekends ago – organization for under the kitchen sink. Ok, so to ease my aches and ailments last night (and to get clean obvi), I did a shower/bath soak “cocktail”. It was midnight but it was amazing. I don’t care if I have to make time for this ritual in the middle of the night – I want to start doing this at least once every other week. If you have never showered and then relaxed in a bath (work before play 😉 ), I went through the full shower process, got out and started the tub. I brushed my teeth, cleaned the residual off my face, and brushed my everyday thickening spray through my hair. I wrapped my head so my hair wouldn’t get messed up and tangled – my hair dresser showed me a trick about tucking the tail of the towel wrap tightly at the base of my neck, something else I had never considered. And here is where I need your help. My mom always brings me goodies and special finds when she visits – some are random but they are so thoughtful. Two weeks ago when she was visiting, she brought a single packaged bath bomb. I had never used one before! Bubble bath, yes. Bath salts, not much but yes. Even bath oil beads when I was younger. Well, I am in love. Addicted. I want a big tub of them. Do you/have you used bath bombs? If so and you have a fav, please please let me know! I am desperate to order some more (like, today). I am not a plumber or an electrician and I’m sure there is a reason why all the piping and cords have to be smack dab in the center of the cabinet, but really?! The most space in the entire thing is actually located BEHIND that mess. The disposal, I get- it has to come straight down. but some of the other stuff? Like positioning the outlet right there?! In the middle?! Ok, so I despise the space under the sink. But, it was in desperate need of help and attention. It actually took me a couple of trips to The Container Store to get my allowed space “right”. I exchanged a few types of shelving and a too-big-for-the-space lazy susan but am so tickled with the end result. Here’s how she looks now. The first thing I did was take everything out. If it belonged in the garage/basement/trash, that’s where it went. We shop at Costco so we do have extra stock of a lot of items; with the limited space, I was fine with those going in the back left corner. 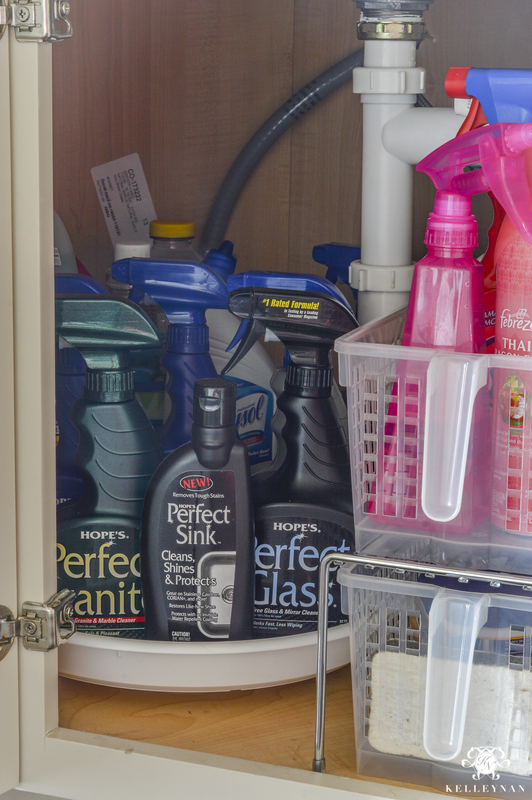 All of my most used Hope’s cleaners were arranged on a 13″ lazy susan for easy access (I told you I loved the Perfect line ;)) – if you can go larger, I totally would… and I tried but in my corner cabinet, with the pipes, there just wasn’t enough room. 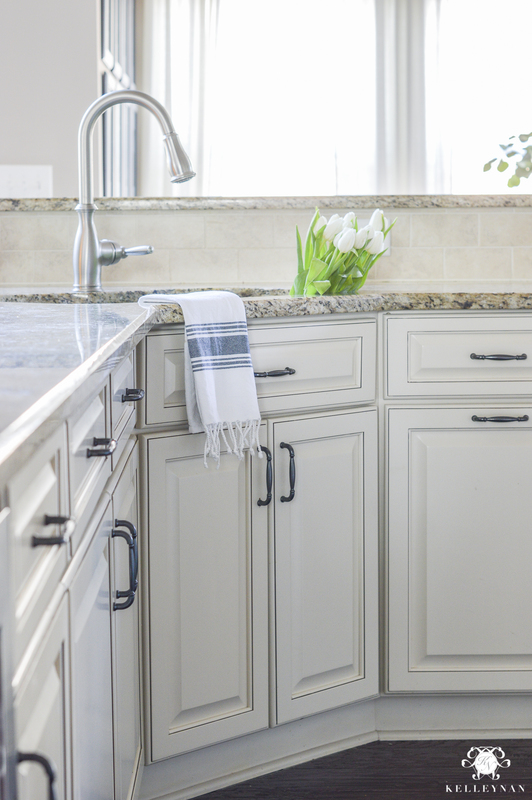 I used this substantial plate rack for two-tiered storage and found handled baskets which could fit underneath to hold sponges, extra drains, and all the “small stuff”. 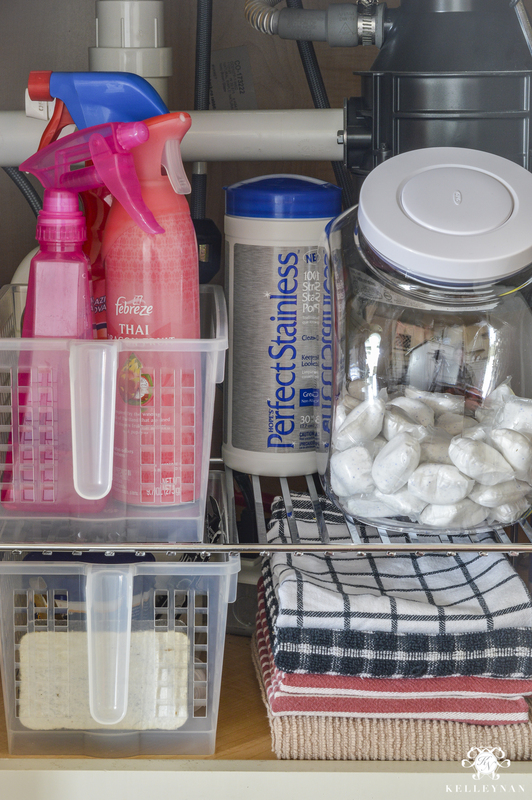 One of the biggest game changers though was this OXO Pop slanted jar for our dishwashing tabs (this is the 5qt.). As I mentioned, we are huge Costco people so we buy in bulk, but the buckets/boxes of tabs are so unwieldy! This new system may be Dave’s favorite thing ever. If you aren’t familiar with the POP containers, the center of the lid is a big button. You push it down and it unlocks the airtight seal. when you close it, you just press it in. They are more costly than some other options but if I had just another container with a locking lid, I wouldn’t use it easily and in the same way. 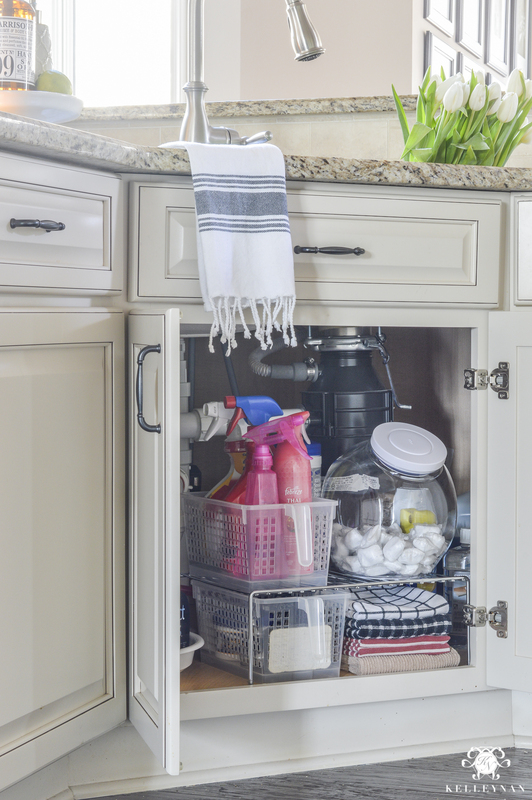 Old dish rags are also stored underneath the rack for cleaning and spills. Having used our new system for about two weeks now, I am totally thrilled. Take inventory of what your space allows for and consider turntables, risers, shelves, baskets, and containers. 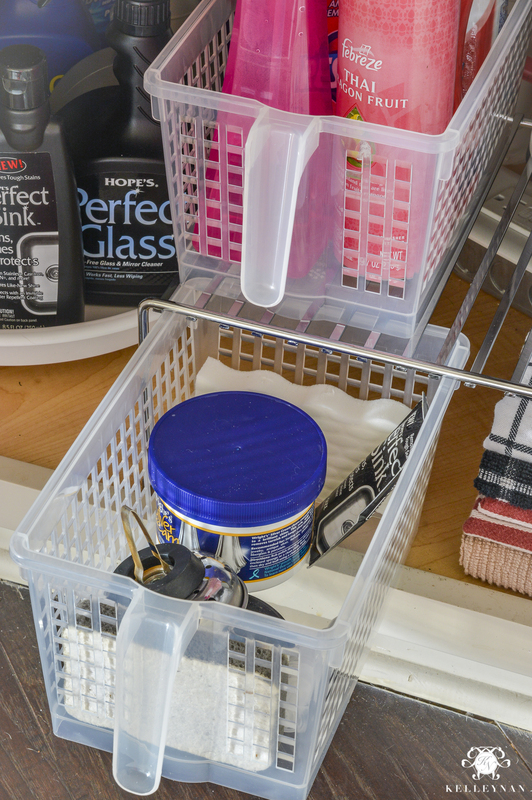 Leave easy access for items you used most often- front and center. 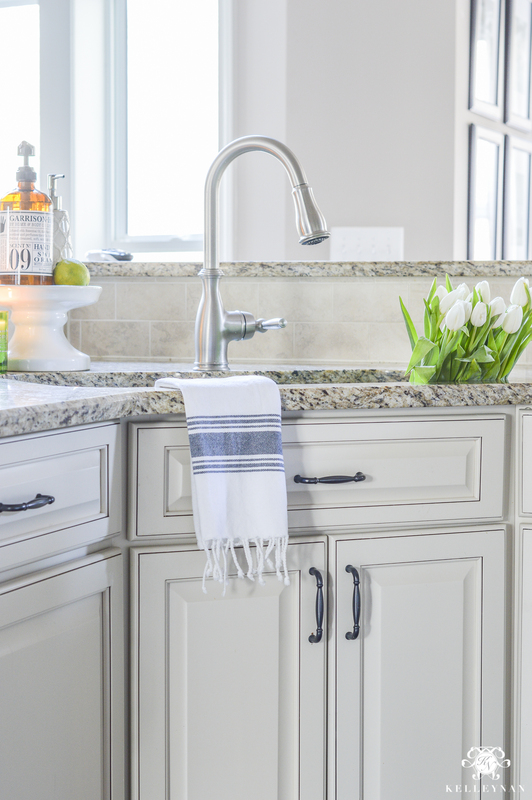 Full kitchen sources and colors available HERE. Stay tuned for more organization posts coming soon and if you missed them, you can check out other recent organization projects HERE. HOVER ABOVE THE BELOW IMAGE TO PIN FOR LATER! I was just noticing that my under-sink area was getting messy. 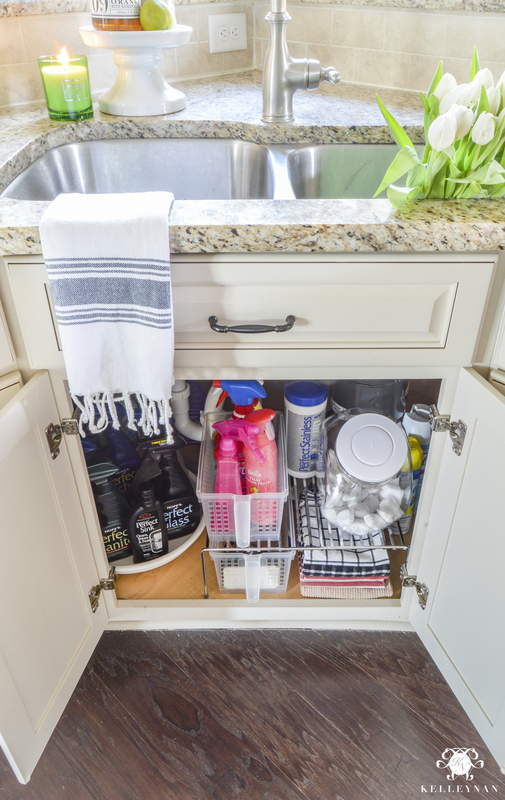 It really can be a hard area to organize with all that plumbing and stuff under there. We even have a reverse osmosis filter and a garbage disposal so we have VERY limited space under ours. I love your ideas and especially that little shelf for some height. Also looking forward to seeing your new lantern hung. We have two of the Darlanas over our kitchen island and I love them! Enjoy your week! Shelley, oh man! Get that thing done and cross it off your list 😉 I am so excited to finally have one! 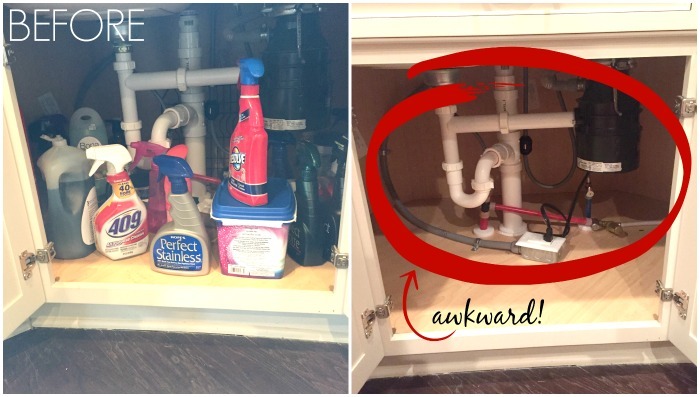 I so needed to see this under sink organization…great job looks wonderful….I too have a horrible set up and not sure why builders have not in ALL this time come up with a better lay out. Monica, I am so sorry but am glad I’m not alone- I totally agree! Gosh…this looks great! Every detail is perfect. Thanks so much for this, Kelley! 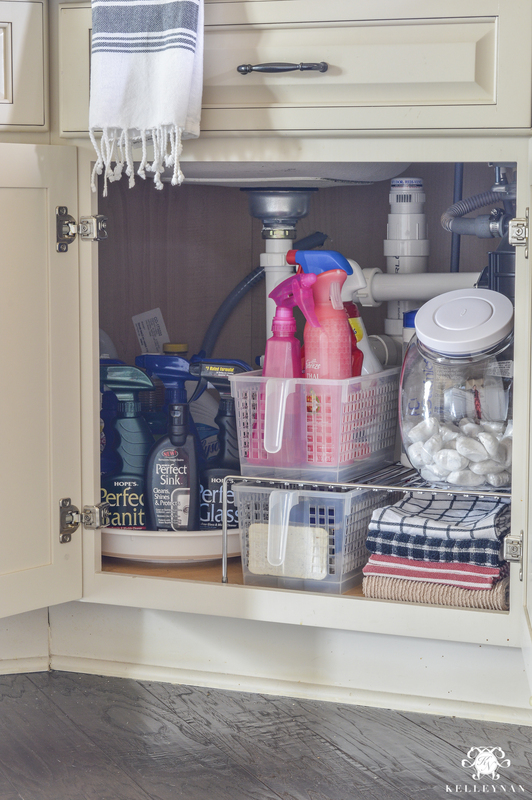 I,ve been thinking for several days that I needed to organize the cabinet under my sink. Now I’m inspired. I also started using Hope’s products after you posted about them. I love them also, so thank you for two great tips. Celeste, I am so glad it was helpful! Good luck and get that thing tackled! Jen, thank you! I can’t wait to see your patio!! Love the lazy susan idea Kelley! It looks great. Lucky for me I’ll be making a trip to Home Goods this weekend. I’ll be adding some things to my list! Thanks again for the inspiration! It looks great! I need to re-organize under my sink. I like the idea of adding levels to make the most of the space and the Lazy Susan! Question- what candle is that? Looks like Bath and Body Works. Thank you so much for being so detailed with what you have where! That helps so much!!! Thanks for the organizational ideas! Always needed! Is that a prayer shawl? We just finished a new build and I’ve been grappling with the under sink mess complicated by pipes, disposals, etc. Ugh. You’re space is almost identical to mine so I shopped your post and should be organized in the time it takes for UPS to deliver my order. Thanks for the great ideas, particularly the jar for dishwasher pods. Yay! 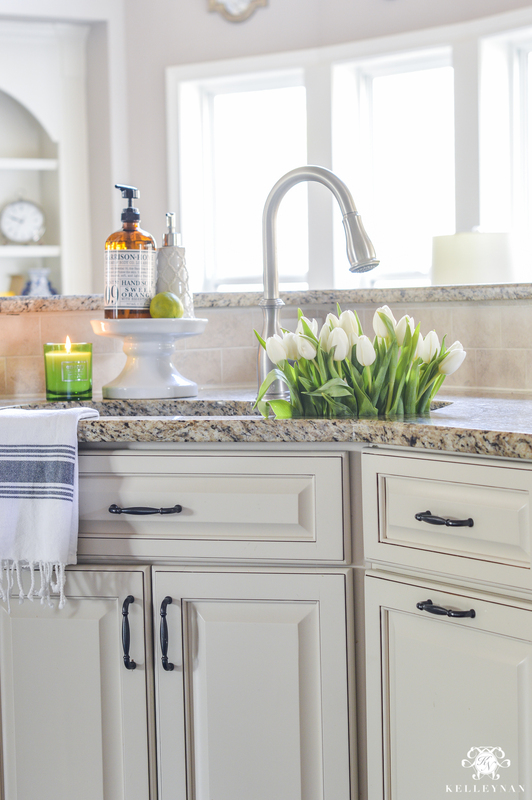 I have my garbage can under the sink, where do you have yours? Hi, Lee! Ours is actually a pull-out drawer next to the sink. Just got new kitchen cabinets and had our whole kitchen redone. 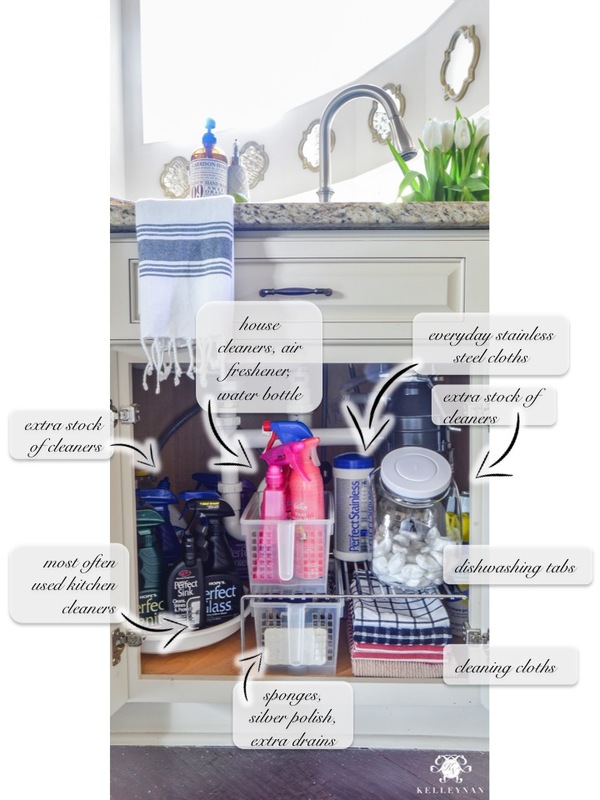 I’m taking this post to the store and getting all of it — even the cleaners (except tabs as we use liquid). I didn’t even know there are everyday stainless cleaning wipes. Yay! There should be a special place in Hades (he-l) for the plumbers and electricians who work under sinks and do what’s easiest for THEM but makes it difficult for US! My current plumber would love to get his hands on my mess of pipes to replumb but I can think of 1000 other ways to spend money! Going to try for the umpteenth time to reorganize. OMG YES!!! Totally agree! haha- best of luck! Kelley, have you come up with any great ideas for the cabinet over the refrigerator?